Here is the official Endurance Nation results update for the week ending on 05/22/2011 – plus a few additions from the previous week. We had a total of 18 athletes race in everything from a sprint to a full Ironman…with more than a 60% rate of personal bests. Congrats to everyone — you can read the full details below. If you’d like to join these folks in training to be your best, please join the Team Waitlist here or consider purchasing an Endurance Nation training plan here. 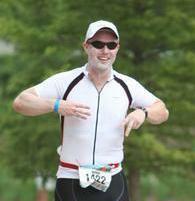 Revolution3 Knoxville – Team EN had a four members compete in this Half-Ironman® distance race. Todd Kauffman finished in 5:07:25. William Wiseman crossed the line in 5:13. Carla Happel finished in 7:56:51 and you can read about the race on her blog here. Jeff Dell set a new PR finishing in 5:33. Terre Haute Triathlon – Matt Sullivan (photo at left) competed in this sprint distance race and finished in 1:53, which is a new PR. 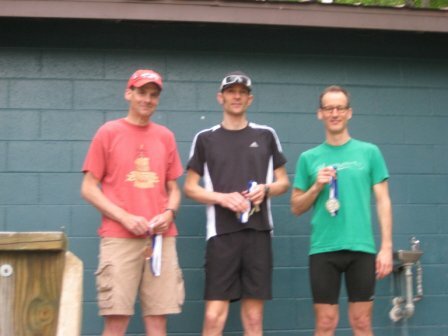 Pokagon – Jeff Linkus crossed the finish line in 44:02.3, a new PR for the Olympic distance. Texas – This full Ironman® distance race had 6 EN members race. Rich Berard set a new PR of 15:10:42. Tom Glynn crossed the finish line in 11:00:10 and members can read his race report here. Franklin Haun finished in 12:10, which is a PR. Wayne Kehr (photo at right) PR’d with a time of 15:41:30. Ned Payne finished with a time of 15:10:42. Nate Pepper (photo at left) set a PR with a time of 15:44:22. Bintan Triathlon – Kevin Hill raced in this Olympic tri and set a new PR with a time of 2:31:40. American Triple T – Ann Frost competed and finished with a time of 12:19:25, good enough for a new PR! JerseyMan – Pete Joachim finished this Half-Ironman® in 5:33:36 for a new PR. Joscelin Grizzetti finished in 5:20. Escape from Fort Delaware – Christy Beal ran this Olympic tri for a time of 3:00:30. Columbia Triathlon – Tim Jardeleza finished in 2:29:06 for an Olympic distance PR.